Always interested in a new gaming system and being pen and paper roleplayers, Brian and I have been playing a little bit of Songs of Blades and Heroes recently. Like many of our gaming experiences, this one has been long delayed in coming but it was well worth the wait. Our first game was a wonderful and thoroughly-illegally built three-way match involving two groups of Orcs and my Reaper Mouselings, his Dwarves and my Mouselings have had it out. The game is interesting and fun and very fast (we played three games on an hour and a half ferry ride) but has a few weak points. Our current warbands are both tricked out minimum figures, maximum damage warbands. Neither has more than 7 figures, each worth at least two dozen points apiece. Hordes of zombies these are not. 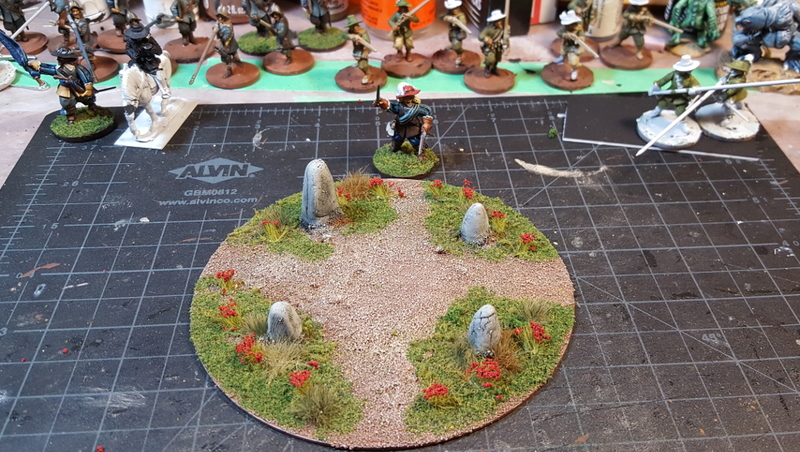 My mouselings have half their 300 point standard warband allotment between my mounted-on-an-owl, magic-using leprechaun leader, Shamus O’Reilly, and his familiar, Mossy, a captive stone golem with shooter(medium) and combat 5. Brian’s dwarves are just as nasty, with the two flanking dogs and a leader with Quality 2 and Combat 5. A note about the game: In order to get units moving and fighting, you need to score successes by rolling at or above the quality on a d6. Combat is a simple oppposed d6 + Combat Value + modifiers. Lower Quality scores are better, higher Combat scores are better. The game itself plays well, with some bad break points. Specifically, magic-users are useless as ranged combat figures, but deadly when they transfix. Combined with Mossy’s powerful combat and throwing ability, this gave my team a one-two killing “punch” that was hard to beat. Add in the dwarves (and mouselings) short-move and you can see where it will go wrong quickly. Where the dwarves beat me was when they were able to get their dogs around into my magic user (only combat 2) and made him move did things go badly. And then there was the rout. Or maybe I should say “The Rout.” Brian apparently cannot roll combat rolls. I cannot roll quality checks to get people moving. These two phenomenmom manifested in one game where I never made it more than one or two short moves away from the table edge (basically less than 4″). When Brian got my leader to book it off the table, this triggered a morale roll every other warband member. Which I failed. And so my entire warband ran off the table. In a single turn. In sum, We do enjoy playing the game, but I am not certain if its simplicities truly make me happy. We need to try some different warbands, including zombies, skeletons and cheap soldiers and see how that works. I’ve built most of a smallish fortress/castle, finally got enough finished to use in a game, and to show off here to update this page! I put the first of these buildings – the Short Tower – up on the site sometime around 2000, and for ten years they’ve been consistently popular. I think I’ve gotten more feedback on these (and some of the other cardboard/paper stuff I have available) than on anything the website’s ever hosted. 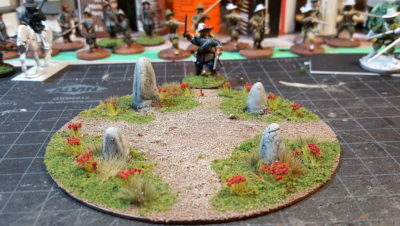 More old photos resurrected – this time a few from a Fantasy Rules! 2nd Edition game we played years ago. Human medieval knights & footmen vs orcs and goblins with necromancer help. I’m pretty sure this was the first outing of Tony’s undead; years later he’s finally got enough to field an all-undead army without help from my figure collection. 15mm fantasy figures, based for Hordes of The Things (HOTT) or Fantasy Rules! (FR!). Many of the figures are long-out-of-production Ral Partha 15mm (from when they held the AD&D license, before WotC bought AD&D from TSR and started producing plastic crap); the rest are a mix of Reaper & Ral Partha 25mm monsters and Chariot 15mm (now produced by Magister Militum/Navigator. Tony wrote this battle report after our most recent FR! game, the first in which his Undead appeared. “When an invading force crosses a river in its onward march, do not advance to meet it in midstream. It is best to let half the army get across and then deliver your attack” – Sun Tzu, The Art of War. On Wednesday night, Brian, Mike, Darren and myself played out a 750 point FR! battle. Mike and I allied against Brian and Darren. It was cool to finally get a game with some undead on the table. I had some lucky rolls, but overall I was pleased with how they played. They are pretty tough to kill (being undead and all), and demoralization is a waste of time. I did manage to summon one unit back, although it was rather difficult. I always find that few spells go through in FR! Part of it is that the army pool is always so much bigger than the second level magic users pool, so it is easier to dispell than cast. On the eastern side, the early loss of the battlewagon was disheartening for the dwarves. They never really recovered from that. The skeletons were able to prevent the human villagers from attacking the flank, and managed to roll really well in combat. By the time the wolves were in striking distance, that part of the battle was already over, with only one dwarven unit left standing. Neil and I had a very interesting FR! battle on Sunday – 1000pts of Dwarves vs. 1000pts of Romans. These are the two ultimate Handweapon armies – fairly small battlelines of really, really good troops. My Dwarves had a Light-Artillery equipped Battlewagon, a flying Small Monster, 1 Elite HW, 8 regular HW and 3 crossbow units. The crossbows had stakes, and the regular HW all had Bombs. Two Traps filled out the list. Neil’s Romans were an entirely ‘straight’ historical early Imperial army – a line of Elite HW Legions with throwing weapons, backed by bow-armed Skirmishers, with some throwing-weapon equipped Mobs and Light & Heavy Cav as support, and one light artillery piece. What was really unique was that the Romans had no magic user at all, while the Dwarves had a Level 2 War Cleric. As it turned out, this mattered less than you might think. The Romans stubbornly refused to believe that magic was really happening, it seems – using just their Army Pool, and some luck, they stopped the bulk of my spells in their tracks! The battlefield was quite crowded – a very large hill and a pair of smaller hills dominated the center of the field, with a river and small forested area off on one flank. Roman setup had the Legions, skirmishers and light arty. together in line, at the back of the large hill. The mobs deployed along the bottom of the large hill, and the cavalry deployed farther out along the flanks, the bulk of it on the right flank. Dwarven setup was my standard Dwarven setup – a line of 6 HW, with refused flanks of crossbows & HW and a pair of HW behind the main line as reserves. The battlewagon was on the right flank with two of the CB units, facing down the Roman cavalry. I`ve found that this double-refused flank with reserves setup works very well with Dwarves, and helps protect this slow-moving army`s flanks very well. Both armies advanced slowly toward each other, the Dwarven light arty getting a couple of shots in, but the Roman artillery being masked by the bulk of the hill they were behind. The Dwarven wargod`s Avatar, summoned by the War Cleric, howled forward and engaged the Legion`s righthand units, being banished shortly but throwing that flank into terrible disorder. Down on the flat, the Dwarven CB deployed their stakes and faced down the Roman cavalry, with both Traps holding units stationary for turn after turn, securing the flank. The battlewagon had charged forward to attack the cavalry, being eventually surrounded and destroyed but fighting grimly for many turns and leaving the cavalry in disarray. The first clash of the infantry battlelines was thunderous – Dwarven Bombs versus Roman pilum and shortbow, with the bombs destroying the center of the Legion`s line, including the light artillery piece. Although the Dwarves were fighting uphill the whole time, they generally prevailed, gradually grinding the Legion down, although not without cost. One notable (although temporary) setback for the Dwarves came when a valiant Roman mob beat a Dwarven HW unit twice, throwing it back off the hill in disorder, although not destroying it. On the left flank, the Dwarven flying small monster (a small Silver Drake) had flown forward and destroyed the only Roman Light Cavalry unit on that flank, while HW & CB units slowly flattened the Roman mobs. The turning point came when the Dwarven Silver Drake shook off it`s fatigue and soared over the Roman lines, terrifying and then destroying first a unit of skirmishers and then a Legion HW unit, while at the same time the Dwarf War Cleric convinced the wargod to return, slaying one of the trapped Roman Heavy Cav units. Dwarven axers continued to fight grimly, and some sembelence of order was imposed on sections of the Dwarven line. All of this was too much for even valiant Legionnaires to take, and the Romans fell back, ceding the field to the Dwarven forces! Thoughts on ‘Magicless’ FR! Games: I’m not going to claim that magic had no effects at all on this fight – the Dwarven wargod’s Avatar was instrumental twice, although he didn’t stick around a long time. Part of this has to do with the peculiar nature of the War Cleric’s spells – the bulk of them are far more subtle and tactical, so that while they can change the outcome of the game, they’re not going to do it single-handedly. Even if you had a more distructive spellcaster – the Fire Shaman comes to mind – the deciding factor of the battle is always the actual clash of units, and usually the clash of battlelines. It also shows off, I think, the integrity of the FR! ruleset – the tactical, combat part of the rules are sound enough, and the magic is not generally overpowering, so that a pure tactical combat army – which is what Neil’s Romans were – can still give a magic-enhanced army a stiff fight. This game, as I said in the report, was neck-to-neck almost right to the end. A really great game!